As you will be able to tell after visiting Drupal.org, this Drupal project has some very useful functionality, but is also early in product development and a group of several developers in the Drupal community are collaborating (and eager for more developers willing to collaborate on new features) to organize the various functionalities in the existing contributions (e.g. 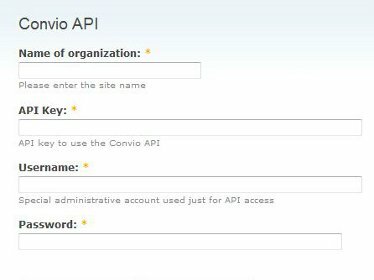 Convio Server and Client API Integration, Single Sign-On, Personalized Content, and Source Code Tracking) into separate, but compatible, Drupal modules with distinct functions, to be used with Convio Online Marketing. If you are considering building a new module for Drupal, or making an investment in integrating your Convio site with Drupal, Convio strongly encourages you to join forces with the developers from the Convio Integration API project to coordinate work and reduce duplicative efforts.